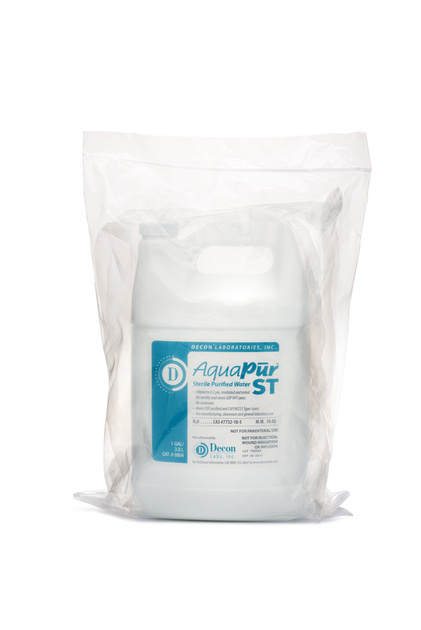 AquaPur™ ST is sterile Purified Water that meets USP specifications, made for use in dilution of sterile disinfectants, manufacturing, general laboratory and cleanroom applications. AquaPur ST sterile Purified Water is made in a validated system incorporating deionization, reverse osmosis, UV treatment, and ultrafiltration then gamma-irradiated and tested to a sterility assurance limit (SAL) of 1×10 -6. Meets WFI specs for endotoxin limit (<0.25 EU/mL). Each case is shipped with a traceable Lot Specific Document. Not for parenteral use. Not for injection, wound irrigation or infusion.